5th in a series on the Norwegian Fjord and Glacier self-guided tour from Authentic Scandinavia. As we booked extra days in Oslo, this was actually Day 7 and 8 for us. Day 7 was another express ferry travel day, our farewell journey on the Sognefjord. If I remember right it was 4 hour ride and I ended up only spending part of the time up top and the rest napping in the comfortable seats below. First the scenery was very like what we had seen the day before, but as we grew closer to Bergen it began to change. There was a sparser area without as many trees. 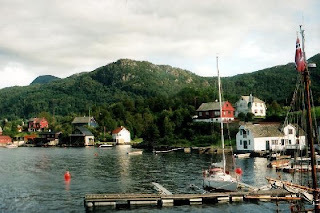 Then as we and began winding through smaller fjords, we could see up small inlets to the right and left where there were small groups of houses accessible only by boat as far as we could tell. The setting was beautiful, but I don't think I could live someplace I couldn't take off for a long walk. Unfortunately I was down below when we passed this area and couldn't get a proper picture through the window. The one below is as close as I could find in a web search, but really doesn't give a feel for how tucked up the inlets and intimate many of these small communities are. The most stressful moment of the day was when we hit the dock at Bergen. 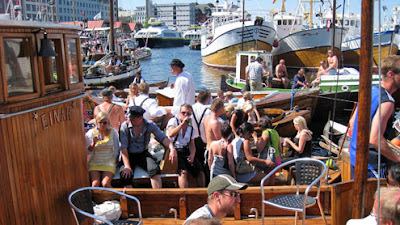 It was Saturday and we were walked off the ferry into a teeming sea of people. 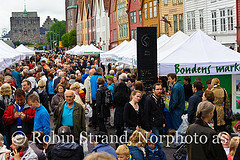 It was the annual Market Day at the historic Bergen Fish Market with numerous kinds of vendors selling everything from food to locally made items. After being in such a small village, the congestion was overwhelming. Somehow we managed to get through the crowd with our luggage in tow to our hotel - the First Hotel Marin - located only 2 blocks off the waterfront and conveniently near many tourist sites. It was too early to check in, so we stored our luggage at the and found a quiet spot a block away called the Aroma to relax over a couple chicken Caesar Salads accompanied by a pint of local brew. Glen had hoped to rent a bike here, but looking at how busy and crazy the streets were with no bike lanes, it quickly became apparent that it would not be either pleasant or safe. In fact we saw very few riding here and online guides discourage it. After eating, I left Glen someplace quiet and did a quick swim through the intense crowd at the market to get a feel for the event and see what it was about. Energy was high. Boats were rafted together 4 deep along the pier. Some had been turned into open air bars or party venues with accordions playing and beer flowing. When the market closed around 6, locals and tourists headed to drinking establishments where the party continued. 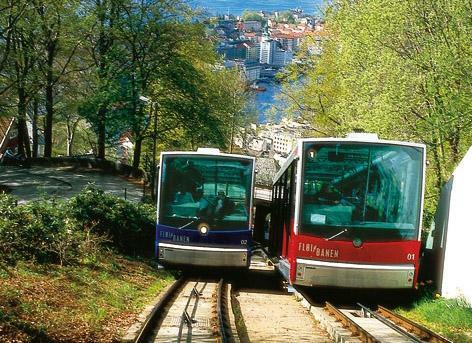 This was the time we headed out for our first walk around Bergen. The city went wild again around 1:30 in the morning as this same sea of humanity - now very drunk - spewed out at closing time and filled the streets. It might have been worth getting out of bed just to be on the street and enjoy the moment. 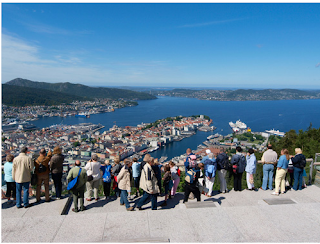 Day 8 – As we had already visited quite a few museums in Oslo, we looked for other opportunities in Bergen. First we walked around the old part of the city going up and down small one lane roads lined with interesting buildings and steep little alleyways with lots of steps that turned out to have apartments all along them. Then we rode the Floibanen Funicular (a cable car) to a stunning viewpoint high above the city. It was a great discovery to also find a network of hiking trails here filled with locals out enjoying the weather. We spent several hours stretching our legs climbing the hills and lucked into opportunities to speak with Norwegians about their lives - including one who lived in one of the small boat access communities. Europeans, especially Norwegians, are in amazing shape and we were smoked by 70-year olds covered in sweat running up the hills as well as a woman with MS on crutches. They LOVE their time outdoors. Unfortunately I tried a panorama and it didn't turn out so pulled the viewpoint photo below from the web. After we returned, we rested for a bit and then headed out for supper and to explore another part of the city. Below are just some random photos. My favourite discoveries were when I found something up a narrow alley. Enjoy! Love the small house tucked in this alley. on this sit ski - a wild ride! Got a kick out of this McDonalds. At least there were no golden arches.